ALONE, the charity that provides services for older people in need, has today launched their Christmas campaign highlighting the isolation and loneliness of older people around Christmas time. 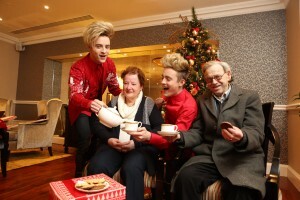 At the launch of the campaign ALONE, joined by Jedward, called on the public to “share your presence” with anyone who may be isolated or lonely this holiday season. Jedward, ALONE’s Christmas Ambassadors commented, “We are so excited to help ALONE launch their Christmas campaign this year. We think that it’s a really important cause and that everyone should take some time to look out for older people in their community. We encourage everyone to spread the Christmas cheer by sharing your presence, which is the most important gift of all”. ALONE say that there are a number of ways that the public can help an older person this Christmas some of these are; calling by an older persons house to say hello, ensuring they have enough food, medication and heat, bringing them out for a drive or to a social event and giving them a hand with their shopping. At Christmas, ALONE’s activities include; the organisation of 250 volunteers who visit older people each week, a Christmas dinner dance for older people and volunteers, the delivery of hundreds of Christmas hampers to older people in need and a special Christmas Day dinner delivery for a number of older people.